On 3rd July 1533, William Blount, Lord Mountjoy and Catherine of Aragon’s chamberlain, was instructed to inform Catherine that she was to stop referring to herself as ‘Queen’ and to recognise her title of Princess Dowager. Henry VIII’s marriage to Catherine had been annulled and his second wife, Anne Boleyn, was now Queen. The words “Princess Dowager” in the report were obliterated by Catherine, who obviously did not agree with the title being used. 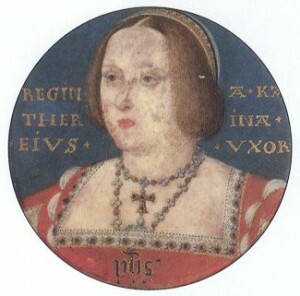 Catherine believed herself to be Queen and did not recognise the annulment or Henry’s second marriage; she would not submit and she would not be bullied. Henry may have got the annulment he wanted, but he could not force his first wife to accept it. Poor Catherine, how miserable she must have been. Is there any record of Catherine refusing to take the official Oath that eventually led to Thomas More’s execution? It makes one wonder why Henry had More executed, yet allowed his former wife to live (in poor conditions), claiming she was the rightful Queen all the way up until her death in 1536. Because Catherine’s nephew would have gone to war with England if she were killed. Ditto Anne of Cleves – her brother the Duke of Cleeves would have acted if his sister was killed – hence the annulment. Anne, Katherine Howard & Catherine Paar (who came close to being beheaded) had no such relations to protect them. Katherine had been crowned and annointed as Queen on the same day as Henry. Why should she not call herself Queen? Henry may not have felt that she had the right by now to call herself Queen as he had married Anne Boleyn and had her crowned instead, but Katherine certainly saw no reason why she should either accept the decision by the English bishops to declare her marriage null and void or that anyone else had any legal right to be Queen in her place. She believed that she was Henry’s lawful wife and had been annointed by God as his Queen. As far as she was concerned no English law, courts or declarations by the King could undo that fact. She would remain stubborn and sign herself Katherine the Queen at the end of her days. Her tomb has the title Katherine the Queen, put there in Victorian times to honour her as such. It is a pity that he treated her badly becasue of it, but good on Katherine for standing up for her lawful rights. Henry may have issued the writ telling Katherine she was no longer queen but he knew he couldn’t force her to accept it as she had a powerful nephew in Charles the head of the Holy Roman Empire……..he didn’t want to risk any come backs on him or England. Of all his wives Katherine was married to him the longest and she knew him better then anyone. I just feel the way Henry treated Katherine was terrible, she didn’t deserve what she got, none of his wives deserved the treatment they got, but the cruelty he inflicted on her would have broken a less strong woman sooner. The only crime she committed, if you can call it a crime, was not having a living son, that was not her fault. The worst part of it all for me is the fact that Henry refused their daughter Mary to visit her mother when she was dying, they wanted/needed to see each other but in an act of sheer vindictiveness he refused their requests to be allowed a visit. Henry really messed up all his kids didn’t he?! I agree with you entirely. I have and always will be an Anne Boleyn fan. She is by far my favorite historical figure, but I feel that Catherine’s fate was in many ways worse than Anne’s. A slow miserable death without the comfort of the one whom she loved most. Basically cast off to die because, like Anne, all she did was fail to produce a living son.